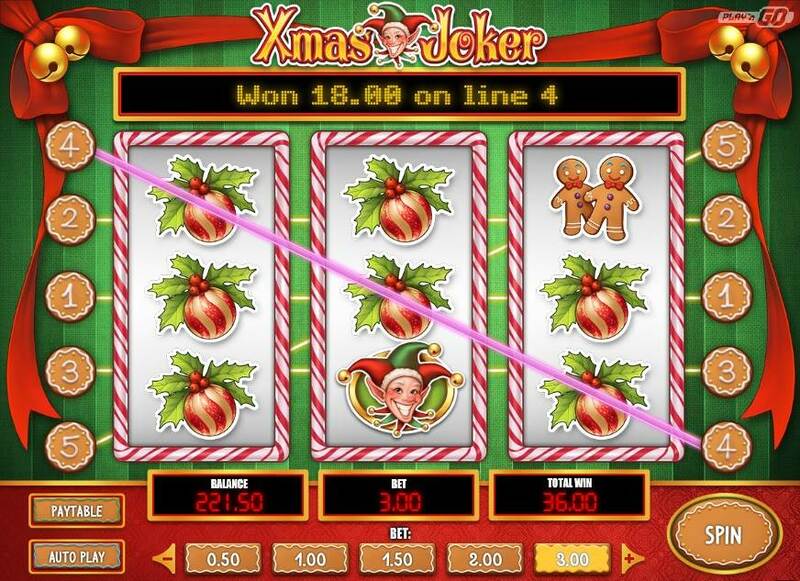 A jolly mobile slot, Xmas Joker has been rolled out right before Christmas to spend your holidays on! Claim bonuses + extra spins! It's never too early for a little bit of Christmas spirit, so Play'n GO have decided to release their newest offering – Xmas Joker – mid November. Based on the original and Christmas-less Mystery Joker slot, the slot has five fixed paylines, a extra spins bonus round and mystery cash prizes too, plenty for all to get excited about. As Play'n GO say, this slot is ‘where sleighbells ring and the reels go ca-ching', so read our Xmas Joker review and decide if this will be your favourite festive season mobile slot. Play'n GO couldn't have gone further from their latest release that we reviewed just last month – Eye of the Kraken. Forget the dark underwater seas and head for the holiday cheer with Xmas Joker, filled with candy cane, bells, presents, elves and gingerbread…lots of it! You might have been physically disgusted when Oxford Street in London announced it's Christmas shopping season open at the beginning of November, but we think that November 19th is just about right for Xmas Joker to be released. It gives you a month before the actual Christmas day to ease yourself into the entire Christmas craze, but if you are not one for all the fairy lights and mince pies, then it's better to leave this slot be. The reels of Xmas Joker are decked out with holly, bells and all the other holiday trimmings, and of course there is the Christmas Joker herself as a scatter symbol too. Last year, it was also Play'n GO that tried to get all of us into a Christmas mood with their slot Merry Xmas and for those who don't know, Play'n GO has been a gaming industry player for a really long time. Actually, it was one of the very first software developers to venture into the mobile games arena and today, the company has an array of 85 games that feature exciting gameplay and lucrative payouts too. 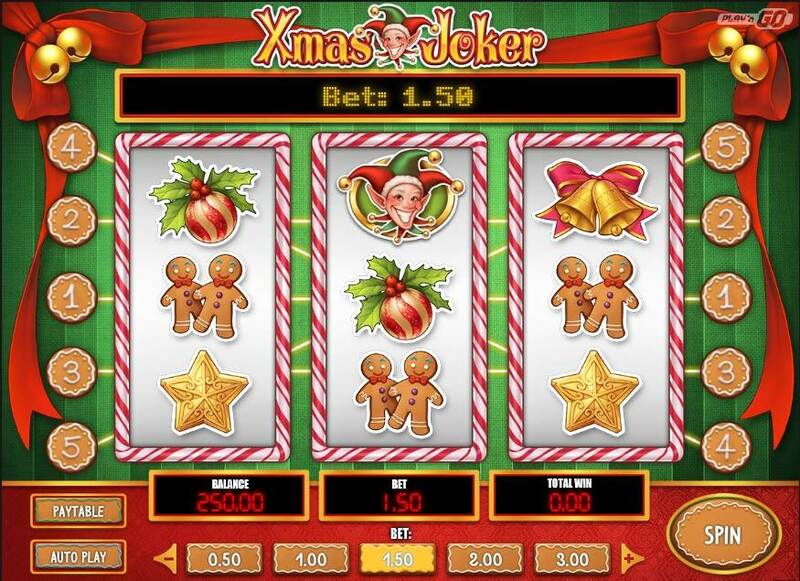 So, you can certainly count on Play'n GO to craft a mobile slot that does what it sets out to and in this case, Xmas Joker gives off a massive Christmas vibe and if you play any seasonal slot this December, you probably won't find a more Christmas-heavy one out there. Overall, the slot looks good and performs really well, which is all you need from a design and performance point of view, really. Now, let's take a look if the winning potential is just as good. This slot resembles a classic fruity and there are three reels with three symbols, in addition to five fixed paylines. What this means is that the spins come and go pretty fast and you must keep up with your balance if you don't wish to walk away empty handed – that would be the worst! The symbols are gingerbread cookies, golden stars, neatly wrapped presents, Christmas baubles, bells and candycane – all of the typical things that represent Christmas. Plus, there are special symbols too that trigger bonus features. If you've never played on one of the dingy old-school slot machines tucked away in a corner somewhere or placed by the loos at a bar, we are here to help you. So, the way to win is to hit three symbols diagonally or horizontally, and there is a payout waiting for you. The bets that you can place range from 50p to £25 and you can effortlessly select your wager by clicking on one of the gingerbread cookies below the reels. The maximum standard payout is £1,250, which you can get if you score three golden stars at the maximum bet. There are larger wins to be had when you enter the extra spins mode and when you consider that random presents will be awarded to you as you play, but more on that in the section below. Although you might not expect as many features as a truly innovative and feature heavy game such as Holmes and the Stolen Stones, Xmas Joker definitely punches above its weight when it comes to features. It offers random Christmas gifts, up to 50 Extra Spins and even larger Christmas gifts during the Extra Spins round! Up To 50 Extra Spins Up For Grabs On Xmas Joker! You must be joking! No, really, you can trigger up to 50 extra spins on this nifty little slot, which is awesome. We wish all slots offered so many free rounds. We especially didn't expect so many extra spins because the slot didn't look very promising when we first caught the news about it, but it's proven us all wrong! Sometimes we say that a game is ‘a slot that keeps on giving'. Well, that's truly the case with Xmas Joker, because as we already mentioned, you can re-trigger the extra spins rounds up to five times. So, watch out for three of the Christmasy elf symbols – the scatters – to land on your reels and you will trigger ten extra spins. 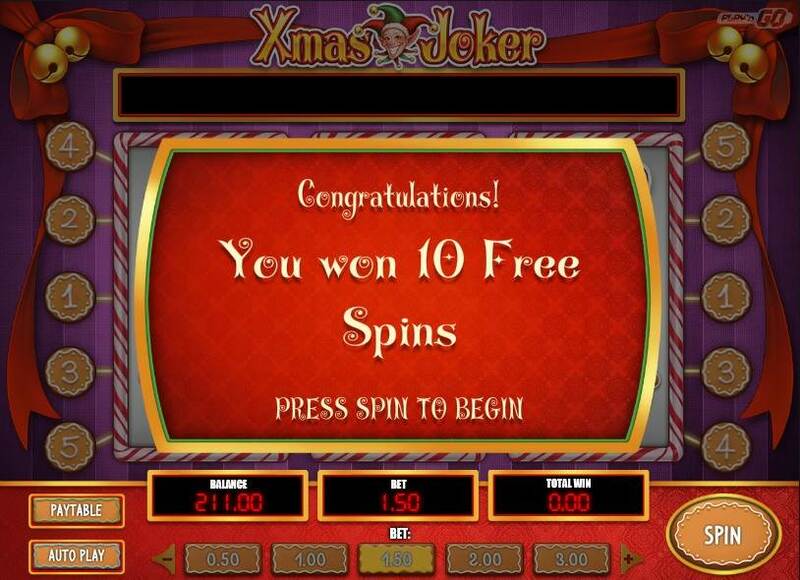 You will be faced with the screen announcing your good luck of 10 extra spins being awarded and clicking ‘spin' will take you through to the Extra Spins mode, similarly decked out in everything that is associated with Christmas on this planet. So, carrying on with the theme of mystery, there is also the Christmas gift feature to watch out for and it doesn't matter if you've been naughty or nice! We all know that the point of Christmas is to be with family, get stuffed and give each other gifts that are meant to be secret. Well, it doesn't always work out like that: kids ask for specific things and you almost always know what you're getting from your significant other (cause you've asked for it, too). So the mystery part of the Gift feature is really the beauty of Xmas Joker. Whenever two gift symbols appear on the reels during extra spins mode, you will be awarded a mystery prize (gasp). The mystery prizes that we got ranged from a moderately sized fiver to a much better offering of £75 – you'll never know what you get. The official word on it is that it will be anywhere from one to 100 times your bet. Then, if you go one up and get three gift symbols on the reels, you will re-trigger the extra spins and get 10 more, in addition to another mystery gift! We think that you will agree this is a really nice touch to the slot that's relatively simple and doesn't have a huge deal of features to it. Want to play Xmas Joker? Claim bonuses and extra spins! 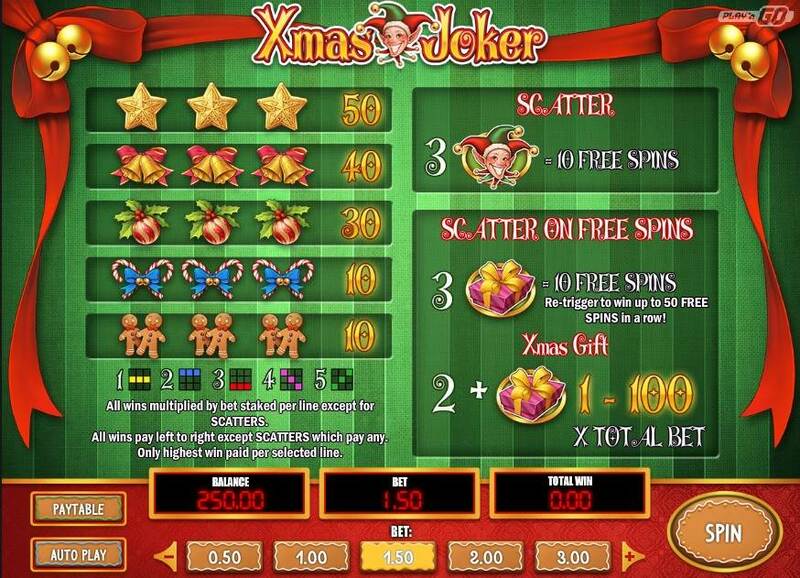 Xmas Joker Play'n GO have done a stellar job at crafting a Christmas slot that is both entertaining and rewarding. You'd think that a classic 3x3 reeler will be too simplistic or even boring to play for hours on end, but that couldn't be further from the truth. As the winter nights roll in and the nights lengthen, Xmas Joker will be your perfect companion. Based on another Play'n GO game, this slot has five fixed paylines and two features that keep on giving: you can get up to a massive 50 extra spins and mystery gifts up to 100 times your wager! Add all that to great graphics, cheerful sound effects and decent animation, and you got yourself the perfect stocking filler slot for when you need a little holiday cheer. Four out of five stars.